Throughout most of the twentieth century, electric propulsion was considered the technology of the future. Now, the future has arrived. 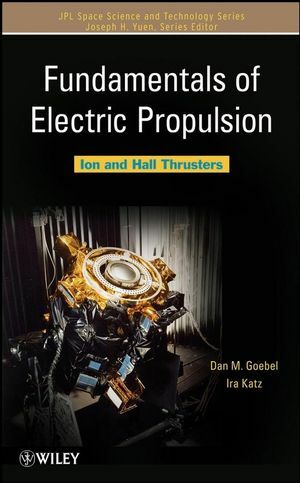 Based largely on research and development performed at the Jet Propulsion Laboratory (JPL) and complemented with scores of tables, figures, homework problems, and references, Fundamentals of Electric Propulsion: Ion and Hall Thrusters is an indispensable textbook for advanced undergraduate and graduate students who are preparing to enter the aerospace industry. It also serves as an equally valuable resource for professional engineers already at work in the field. Dan M. Goebel, PhD, is a Senior Research Scientist in the Advanced Propulsion Technology Group at JPL in Pasadena, California. Since joining JPL in 2003, he has worked on the development of high-efficiency ion thrusters, advanced long life cathodes and grids, and electric-thruster life models for deep space missions. He is a world-recognized expert in ion thrusters, cathodes, advanced plasma sources, microwave sources, high-voltage engineering, and pulsed power switches.? Ira Katz, PhD, has led the Advanced Propulsion Technology Group at NASA JPL since 2001. Group accomplishments during his tenure include the development and testing of the 25 kW NEXIS ion thruster, successful completion of the world's longest electric thruster life test, development of technology and support for precision formation flying missions (ST7, Lisa, TPF-I), and laboratory investigations and computer modeling of fundamental electric propulsion physics. Dr. Katz is recognized as a world leader in computer modeling of spacecraft-plasma interactions, spacecraft charging, and ion thruster physics. Note from the Series Editor. 2.2 Force Transfer in Ion and Hall Thrusters. 2.7 Neutral Densities and Ingestion in Electric Thrusters. Chapter 3: Basic Plasma Physics. 3.4 particle Energies and Velocities. 3.5 Plasma as a Fluid. 3.6 Diffusion in Partially Ionized Gases. 3.7 Sheaths at the Boundaries of Plasmas. Chapter 4: Ion Thruster Plasma Generators. 4.2 Idealized Ion Thruster Plasma Generator. 4.3 DC Discharge Ion Thruster. 4.7 2-D Computer Models of the Ion Thruster Discharge Chamber. Chapter 5: Ion Thruster Accelerator Grids. 5.6 Ion Accelerator Grid Life. 6.3 Thermionic Electron Emitter Characteristics. 6.6 Hollow cathode Thermal Models. 6.9 Keeper Wear and Life. 7.2 Thruster Operating Principles and Scaling. 7.3 Hall Thruster Performance Models. 7.4 Channel Physics and Numerical Modeling. Chapter 8: Ion and Hall Thruster Plumes. Chapter 9: Flight Ion and Hall Thrusters. B: Gas Flow Unit Conversions and Cathode Pressure Estimates. C: Energy Loss by Electrons. D: Ionization and Excitation Cross Sections for Xenon. E: Ionization and Excitation Reaction Rates for Xenon in Maxwellian Plasmas. F: Electron Relaxation and Thermalization Times. G: Clausing Factor Monte Carlo Calculation.